This study examines the use of superconducting magnetic and battery hybrid energy storage to compensate grid voltage fluctuations. The superconducting magnetic energy storage system (SMES) has been emulated by a high current inductor to investigate a system employing both SMES and battery energy storage experimentally. The design of the laboratory prototype is described in detail, which consists of a series-connected three phase voltage source inverter used to regulate AC voltage, and two bidirectional DC/DC converters used to control energy storage system charge and discharge. ‘DC bus level signaling’ and ‘voltage droop control’ have been used to automatically control power from the magnetic energy storage system during short-duration, high power voltage sags, while the battery is used to provide power during longer-term, low power under-voltages. Energy storage system hybridization is shown to be advantageous by reducing battery peak power demand compared with a battery-only system, and by improving long term voltage support capability compared with a SMES-only system. Consequently, the SMES/battery hybrid DVR can support both short term high-power voltage sags and long term undervoltages with significantly reduced superconducting material cost compared with a SMES-based system. Figure 2. Hybrid System Experimental results: 0.1s Three phase sag to 35% of nominal voltage. 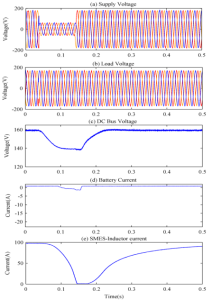 (a) Supply voltages (b) Load voltages (c) DC Link Voltage (d) Battery Current (e) SMES-inductor current. Figure 3. Battery System Experimental results: 0.1s Three phase sag to 35% of nominal voltage. 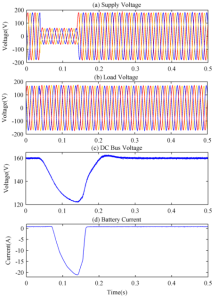 (a) Supply voltages (b) Load voltages (c) DC Link Voltage (d) Battery Current. Figure 4. Hybrid System Experimental results: Long-term three phase undervoltage (a) RMS supply phase-voltage. 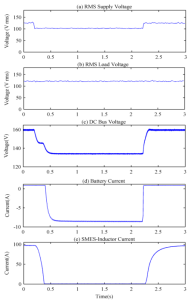 (b) RMS load phase-voltage (c) DC Bus Voltage (d) Battery Current (e) SMES-inductor current. K. Ray, S.R. Mohanty, N. Kishor, and J.P.S. Catalao, “Optimal Feature and Decision Tree-Based Classification of Power Quality Disturbances in Distributed Generation Systems,” Sustainable Energy, IEEE Trans., vol. 5, Sept. 2014, pp. 200-208. Novosel, G. Bartok, G. Henneberg, P. Mysore, D. Tziouvaras, and S. Ward, “IEEE PSRC Report on Performance of Relaying During Wide-Area Stressed Conditions,” Power Delivery, IEEE Trans., vol. 25, Jan. 2010, pp. 3-16. Jothibasu and M.K. Mishra, “A Control Scheme for Storageless DVR Based on Characterization of Voltage Sags,” Power Delivery, IEEE Trans., vol. 29, July 2014, pp. 2261-2269. Otomega and T. Van Cutsem, “Undervoltage Load Shedding Using Distributed Controllers,” Power Systems, IEEE Trans., vol. 22, Nov. 2007, pp. 1898-1907. Penetration of various types of distributed energy resources (DERs) like solar, wind, and plug-in hybrid electric vehicles (PHEVs) onto the distribution grid is on the rise. There is a corresponding increase in power quality problems and intermittencies on the distribution grid. In order to reduce the intermittencies and improve the power quality of the distribution grid, an ultracapacitor (UCAP) integrated power conditioner is proposed in this paper. UCAP integration gives the power conditioner active power capability, which is useful in tackling the grid intermittencies and in improving the voltage sag and swell compensation. UCAPs have low energy density, high-power density, and fast charge/discharge rates, which are all ideal characteristics for meeting high-power low-energy events like grid intermittencies, sags/swells. In this paper, UCAP is integrated into dc-link of the power conditioner through a bidirectional dc–dc converter that helps in providing a stiff dc-link voltage. The integration helps in providing active/reactive power support, intermittency smoothing, and sag/swell compensation. 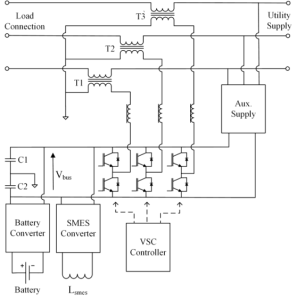 Design and control of both the dc–ac inverters and the dc–dc converter are discussed. The simulation model of the overall system is developed and compared with the experimental hardware setup. Fig. 1. One-line diagram of power conditioner with UCAP energy storage. Fig. 2. (a) Source and load rms voltages Vsrms and VLrms during sag. (b) Source voltages Vsab (blue), Vsbc (red), and Vsca (green) during sag. (c) Injected voltages Vinj2a (blue), Vinj2b (red), and Vinj2c (green) during sag. (d) Load voltages VLab (blue), VLbc (red), and VLca (green) during sag. power of grid, load, and inverter during voltage sag. In this paper, the concept of integrating UCAP-based rechargeable energy storage to a power conditioner system to improve the power quality of the distribution grid is presented. With this integration, the DVR portion of the power conditioner will be able to independently compensate voltage sags and swells and the APF portion of the power conditioner will be able to provide active/reactive power support and renewable intermittency smoothing to the distribution grid. UCAP integration through a bidirectional dc–dc converter at the dc-link of the power conditioner is proposed. The control strategy of the series inverter (DVR) is based on inphase compensation and the control strategy of the shunt inverter (APF) is based on id − iq method. Designs of major components in the power stage of the bidirectional dc–dc converter are discussed. Average current mode control is used to regulate the output voltage of the dc–dc converter due to its inherently stable characteristic. A higher level integrated controller that takes decisions based on the system parameters provides inputs to the inverters and dc–dc converter controllers to carry out their control actions. The simulation of the integrated UCAP-PC system which consists of the UCAP, bidirectional dc–dc converter, and the series and shunt inverters is carried out using PSCAD. The simulation of the UCAP-PC system is carried out using PSCAD. Hardware experimental setup of the integrated system is presented and the ability to provide temporary voltage sag compensation and active/reactive power support and renewable intermittency smoothing to the distribution grid is tested. Results from simulation and experiment agree well with each other thereby verifying the concepts introduced in this paper. Similar UCAP based energy storages can be deployed in the future in a microgrid or a low-voltage distribution grid to respond to dynamic changes in the voltage profiles and power profiles on the distribution grid. N. H. Woodley, L. Morgan, and A. Sundaram, “Experience with an inverter-based dynamic voltage restorer,” IEEE Trans. Power Del., vol. 14, no. 3, pp. 1181–1186, Jul. 1999. J. G. Nielsen, M. Newman, H. Nielsen, and F. Blaabjerg, “Control and testing of a dynamic voltage restorer (DVR) at medium voltage level,” IEEE Trans. Power Electron., vol. 19, no. 3, pp. 806–813, May 2004. V. Soares, P. Verdelho, and G. D. Marques, “An instantaneous active and reactive current component method for active filters,” IEEE Trans. Power Electron., vol. 15, no. 4, pp. 660–669, Jul. 2000. K. Sahay and B. Dwivedi, “Supercapacitors energy storage system for power quality improvement: An overview,” J. Energy Sources, vol. 10, no. 10, pp. 1–8, 2009.